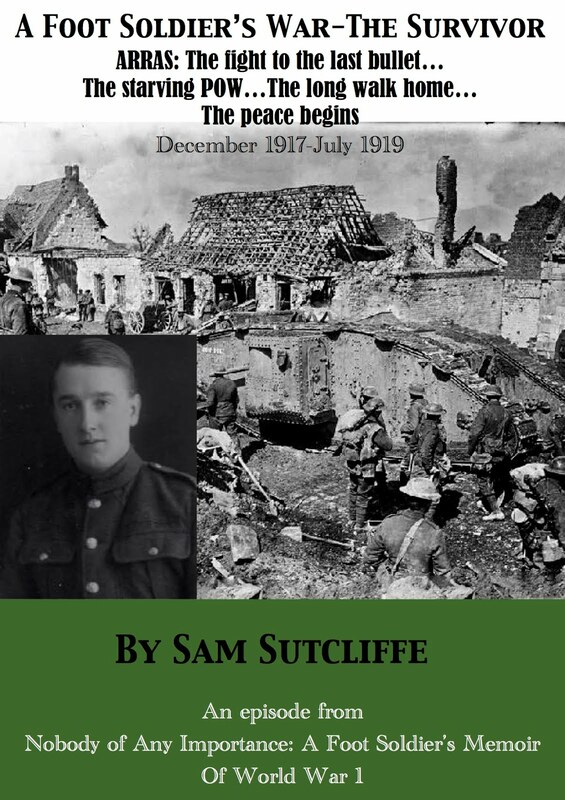 FootSoldierSam: Sam on the Somme, July 1 looming, reluctantly dons his extra stripe, survives another hair-raising night in No Man’s Land… and comes upon school children at play within shelling distance of the Front! On the Eastern Front, the Russian Brusilov Offensive continued its sequence of successes against Austrian and German forces, especially in Ukraine around Czernowitz and Lutsk (June 19-21). But the strain of fighting on many fronts seemed to be showing as they came under attack from the Turkish Army near their recent conquest Trebizond (23) and lost Qasr-i-Shirin in Western Persia back to the same foe (20). The Ottoman Empire was losing out to the rebels led by Sharif Hussain of Mecca, though, with reports that in the first ten days fighting (in current Saudi Arabia) they’d taken Mecca, Jeddah and Taif. Last week, Sam and his Kensington comrades got caught out on one of their night-time No Man’s Land ventures in what their Company A Captain bluntly described as a “balls-up”. But then they found some relief – delousing, baths, clean uniforms – some kilometres back at Halloy, where they also rehearsed in front-line replica trenches for what my father laconically called the Great Day, “this wonderful occasion we awaited with mounting apprehension”. Personally, Sam got another kind of “nasty jolt” when the Captain told him of his promotion to Corporal, although he’d already requested demotion to Private because he had no wish to order other men around. ‘So, we returned to the front line, a different section to the one we’d previously occupied. During my first night on duty there, away to our right I witnessed my first battle of flame-throwers. I’d heard about these brutes – and that the Germans used them first – but on this occasion our people were retaliating in kind*. The machines used must have been in a very early stage of development. I do know this kind of warfare was considered, like poison gas, to be inhumane and very wicked. Did this make maiming and killing by bullets and shells more acceptable? On our foot-slogging journey forward, we had seen a massive concentration of guns from mighty howitzers way back, through the various calibres down to the very mobile field guns which fired 18-pounder shells – most of them well-camouflaged for concealment from aeroplanes and captive-balloon observers. Their presence in such great numbers warned us of great trouble to come. We took over a front-line trench deeper and wider than any I’d previously seen. So very spick and span! Thereafter, pick-and-shovel parties of Engineers came in each night and worked like beavers. While we kept watch, sent out patrols, and did all the usual front-line chores, they dug drainage holes or gulleys in the floor of our trench and laid duckboards over the drains or sumps. Their labour meant that a rainy day no longer saw us standing in a sea of mud for hours on end. For a final impressive touch, they reinforced the sides of our trenches with what the Engineers called “expanded metal” – it looked like small-mesh wire netting, but was actually made by expanding solid sheets of metal until small holes appeared. Held in place by stout, two-inch, wood squaring, this metal mesh would hopefully resist collapse under heavy shelling. Certainly, while the stuff lasted, we felt we held a kind of fort rather than a trench; a false sense of security, for what could it do for you when shells fell into your trench? No additional stripes had actually been issued to me, despite the Captain’s unwanted promise of promotion, and I certainly made no effort to procure them. 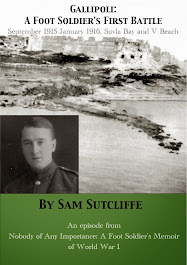 However, I was sharply reminded of the matter when a subaltern (one pip) told me that he and I were to cross, in the open, the spaces between our trench and some lookout posts fairly close to the German trenches – our first defence against surprise attacks by the large patrol groups which sometimes raided across No Man’s Land. Men in the advance posts had to stay there for several days at a time. We would visit them in turn, under cover of darkness, collect their reports and note any requirements they had. Certain guidelines improved the chances of survival on such black nights when patrolling the battlefield. Large, dark patches should be avoided – being shell-holes, usually. If something resisted the forward motion of one of your feet, you stopped, moved that foot back and changed direction slightly, endeavouring to avoid being tripped. When a machine-gun opened up – unless, by bad luck, it was trained on you at the moment it commenced firing – you could hope to escape injury by quickly lying down, otherwise it might catch you as it traversed. As we crept along, once or twice something touched my backside, but a quick backward glance provided a clue – my rather tall officer had adopted the same posture as me, advancing with head well down. His right hand, held forward, grasped a pistol and this occasionally poked my bum. Pray heaven his finger isn’t on the trigger, I thought. A nice lad he was, peach-and-roses complexion, far too good-looking to be mussed up by bullet or shrapnel. We had to do that job several nights running**. Each outing took two hours or longer, including the time spent with each lookout group, who all welcomed our visits. Corporal So-and-So was a tall, broad, tough-looking type, rather swarthy as to complexion, somehow foreign-looking. That Sergeant I previously mentioned who shouted rude words towards the Germans at morning stand-to had the same sort of look, as did also an officer I’d recently noticed, and several other men – all this probably due to the fact that this Territorial Battalion was based in West London***. I still felt like a stranger with this lot, though by this time I knew, and was known by, a fair number of men. The order duly came through, I had the chaps on their firing steps, then I moved along the front line to the point from which the patrol would depart through a gap in our barbed wire – a spot I was familiar with, for hadn’t I used it on my own nightly walkies with the young Lieutenant and his prodding pistol? Corporal So-and-So led the way up and over, his men followed quietly, and all vanished into the coal-black night. Our Company officer remained staring in the direction of the dear departed. Then he warned me that I and my men were responsible for holding our section of the front whatever happened and must on no account leave it. I visited our bays, having a word with the lads all along my bit of front. We waited. German machine guns sprayed our section at fairly regular intervals. From time to time, the usual flurries of whizz-bangs burst… I never ceased to marvel at the speed with which they reached us, before we’d even heard the guns fire… An ordinary trench-war night, in fact, when you’d have to be dead unlucky to stop one. Weighing up the immediate possibilities, I realised my orders were ridiculous and impossible to comply with. Between my line of men on the firing step and our patrol out there lay a mass of barbed wire we put there to prevent Jerry from overrunning us. But, of course, it would also prevent us from helping our chaps if they found trouble in No Man’s Land. Corporal So-and-So would have to keep his men close together somehow, so he could lead them back through the gap in the wire – otherwise, they would end up skewered and hanging on it. The night suddenly came to life. Shouts and screams out there. Verey lights flared, but no extra shooting broke out because no one knew just what was happening. Then, high above the other voices, I heard a shout, “Back to the valley!” This was repeated. The Corporal’s voice and it portended bad trouble. Soon, ahead of me, as I stood listening on a fire step, I heard groans and whimpering. “What’s up there?” I called. A faint reply told me the chap had a leg wound, that our lads had met a large, German patrol head-on. “Drag yourself along the wire to your right as you face me and I’ll get help to you,” I called. I hurried along to the patrol’s departure point and reported to the Captain about the man in trouble. The little Sergeant who daily threatened to knock seven different kinds of whatsit out of the Jerries stood nearby and immediately offered to bring the man in. I suggested the need for speed because all hell would be let loose as soon as the German patrol got back to its front line. With the officer’s permission and a volunteer to accompany him the nippy Sergeant was up and away. I quickly rejoined my party. No more groans from out front and, later, we learnt that the two rescuers had done a speedy job. When they returned with the injured man, they were quickly followed through the gap in the wire by the Corporal and most of his patrol. The “valley” he’d been shouting about was a depression about halfway between us and the enemy positions. He’d taken the patrol to it on the way out and told them it should be the rallying point before leaving for “home”. Meeting a large, enemy patrol had not been a possibility allowed for in the pre-operational briefing. The unexpected encounter had, for a moment, changed a volunteer, promotion-seeking Corporal into a shouting windbag, but once the lads got together in the “valley”, their leader did recover his self-control and brought them back in good order. They had not, however, as planned, penetrated any enemy positions, nor captured prisoners for interrogation purposes. I had the feeling the Corporal had pressed to lead this adventure. Some men did strive to give forth the impression that they were braver than most. But only real action could support or confound the contention. For a kind of rest, we moved back to a village perhaps two miles behind the front line****. Its buildings, although mostly damaged, provided ample good accommodation for all of us. The place was not attracting much shellfire, but it seemed wise to spend most of the time out of sight so as not to push our luck. I was crossing the main street for some good purpose when a booming voice stopped me in my tracks: “Corporal Norcliffe! ***** You are improperly dressed! Report to me in an hour’s time and have that other stripe sewn on by then or else!” It was the tall, burly, Regimental Sergeant Major. So far I had seen little of him and had no idea he was aware of my existence, let alone my name. Our brief interview started in a strictly official style, but continued in a friendly, almost intimate way as these things did “up the line”. Firmly, though unwillingly, trapped in the NCO category – I wore two stripes, but often did the work of a man wearing three****** – I still determined, albeit without visible protest, to try any ploy which might result in my getting some leave. In each letter home I harped on this subject, in the knowledge that one of my Company officers would read of the unfair treatment I felt had been my lot. While stationed in that village, I had what was to me a heart-touching experience. I had assumed all civilians had long ago left because it was so close to the trenches. Badly strafed at various times, the parts of the village I grew familiar with had the stricken appearance I had come to associate with places that were simply doomed. But one afternoon, free for a few hours before the nightly trek to No Man’s Land where we continued the job of deepening advanced trenches, I got away from it all by slipping out through the back streets (quite unlawfully for, as an NCO, I must be available at all times). A big stretch of open country spread before me as, clear of the village, I rested against a grassy bank, enjoying the warm sunshine. I enjoyed being completely alone and realised how seldom this happened. Then, I thought I heard children’s voices… Sure enough, looking back I saw a small school and a few youngsters outside at play. It seemed unbelievable; we had walked here from the front-line trenches. The wickedness of keeping them in that situation of hourly danger worried me, yet the sweetness and homeliness of the scene and the music of children’s voices almost had me weeping. There followed a big bang and I saw a cloud of smoke floating upwards at a point much nearer to the children than I was. But the children ignored it and play continued. Then, when a second bang sounded off, I saw a heavy battery of British guns positioned below ground level, quite close to the school. The kids were used to it. If they didn’t mind, why should I? And yet, one day, Jerry will have a go at the guns, I thought, and then the school may suffer. I felt loath to leave and rejoin the men whom I really should never have left. The forward battle area always had seemed a place apart from normal life, nothing to do with beauty, homeliness, love, children, girls, homes, furniture, gardens, flowers – no connection at all with any of those things which men and women enjoy, appreciate and lovingly care for – things, politicians told us, we were fighting to preserve. Yet, up there in the trenches, we did as ordered by our superiors, coupling with that work the really important objective – namely to preserve ourselves from injury and death. * German scientists did invent the “Flammenwerfer”, first used in combat during 1915; they were cumbersome with a maximum range of about 20 yards; the British soon responded with the “Livens Large Gallery Flame Projector”, named after its inventor. ** This seems to have occurred during the course of a long stint for the Kensingtons in and around the trenches while based in Hébuterne and/or Sailly, June 9-21. *** Unhelpful Endnote alert: I’ve tried, but I can’t discover which group of late 19th/early 20th-Century immigrants my father referred to here. Anyone who can work it out, please let me know! **** As I’ve said in earlier blogs, I think my father’s memory failed him on the sequencing of some events in June, 1915 – and probably others he and the Kensingtons were involved in after July 1. (Well, phlegmatic though he outwardly remained, that day did rather shake him up, as you’ll see.) The village he describes here, where he locates himself for the next few pages/incidents, would seem to be Sailly, but at about this point the Kensingtons actually moved to Souastre. Still it may be that a group or groups of men from the Battalion were deployed elsewhere in the Gommecourt sector. Fog of war, you know. On many points of detail total certainty is not available. 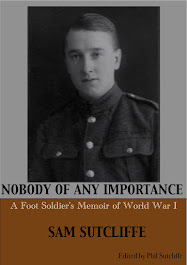 ***** “Norcliffe” being the rather obvious alias my father maintained for himself throughout the Memoir – I don’t know why! ****** A Sergeant wears three stripes. 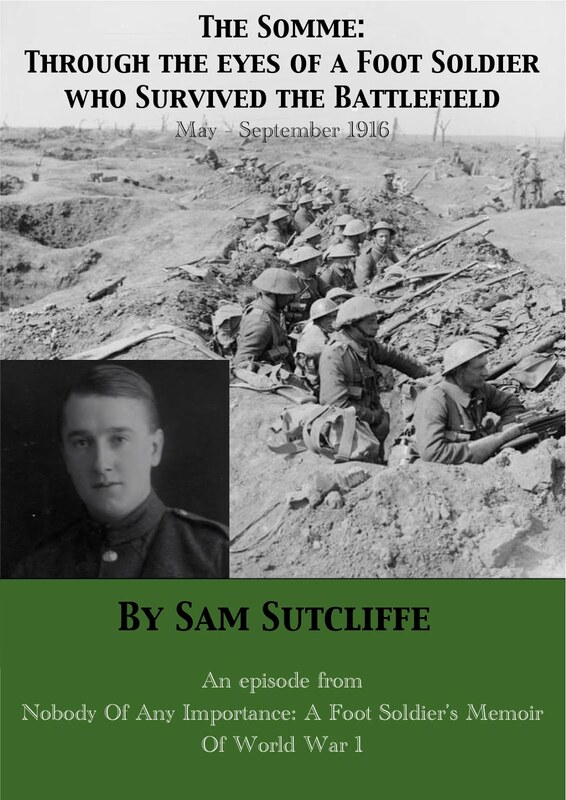 NB: today, and throughout the summer, these blogs will be unusually long, simply because Sam had such vivid memories of, and so much to say about, his experiences a hundred years ago on the Somme. I hope you’ll agree there’s not too much wasted verbiage and plenty of truth and substance. Sam, 17, in the Somme front line, July 1, 1916.